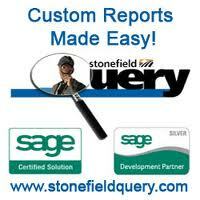 Eliminate the need to pay extra for custom reports. A new customizable report option grid allows you to create custom filters and sort options for your reports and then save them for reuse. Access your favorite data drillers quickly and easily. A new data driller organization tool allows you to define Dataview Groups and associate default data drillers to each. Make sure preferred customers have priority on available inventory. A new check box in Sales Order lets you reserve inventory for a particular customer order, thus eliminating the risk of penalties due to low stock. Streamline your data import process with enhanced import options. A new display indicating the current import status. Quick Import no longer prompts you at each stage of the process, and now runs silently in the background. New import options include Item at Location and Item Supplier. You can now also import line-level descriptions and import and export vendor cost levels. When importing payroll posting, there is an option to print the invalid posting report prior to completion. Enjoy enhanced flexibility in exporting data. You can now export from Data Center tables sending your tables and fields to several formats: Microsoft Excel, ASCII Delimited, XML, and CSV. Save money on payroll printing. The overflow check stub feature prints the overflow of check stubs to blank paper or a separate printer when a check has more than 12 advice lines. Set up multiple Inter-Company Transaction accounts for clearer audit trails. The Inter-Company Transaction (ICT) module now allows you to select any General Ledger account as the Inter-Company Clearing account. Easily access more details on Inter-Company Transactions through enhanced reports. You can run a summary report for Inter-Company Transactions that were distributed in the source company, received from other companies, or consolidated, distributed, or received. Sage Pro ERP is now compatible with Microsoft Office® 2007 and Microsoft SQL Server® 2008. You can now edit the required quantities of released component lines of a work order keeping work orders more up to date. Change the order quantity of Sales Order finished good line items. Edit the order quantity of finished good line items easily. And when the quantity of that line is changed, reconfiguration of components takes place automatically. Improved performance in a multiuser environment. Sage Pro 2010 technology facilitates storing the screen positions in a local table instead of the system table SYUFSPR if preferred.